The Southwood volleyball team kept their tournament winning ways going Saturday, winning their 8th straight sectional title with a 25-21, 25-14, 26-24 win over Manchester. Earlier in the day the Knights topped Wabash 25-17, 25-21, 25-9 to make it to the finals. Manchester defeated Oak Hill 28-26, 25-14, 25-21. The Lady Knights went to Katelyn Murphy early who had three kills as Southwood led 4-3 when Manchester got a block from Madison Isbell and scored two in a row to lead 5-4. The two team would trade blows until the Knights led 12-10 when Murphy would record two kills in a 5-0 run to grab a 16-10 lead. The Knights would build their lead to 22-12 when things got tight in a hurry. Manchester scored three straight with a Kendra Binkley kill then at 23-15 would score six straight to make it 23-21. During the run Merret Metzger would serve three straight aces. The Knights would score the next two for the 25-21 win. Southwood dominated game two early, grabbing a 9-2 lead and building it to 19-7. During an early 6-0 run Murphy and Sarah Peters had a combo block with Peterson serving during the run. In a 5-2 spurt Murphy and Bailey Hobbs had kills. Up 19-7 the Knights would trade points with the Squires for the 25-14 final. The IHSAA Football Sectional semi final round is now set. This week’s match ups for Wabash County teams are, in 2A Sectional #34, Wabash (21-7 winners over Manchester) will host Bremen, 48-27 winners over Prairie Heights at Alumni Field. In 1A, Southwood, fresh off of a 62-14 road win at Fremont, come home to host Southern Wells, who beat North Miami 29-14 in Sectional #43. Northfield drew the bye. They will travel to South Adams, last second 9-6 winners over Adams Central. Rick and Tim Harness will lead the broadcast from Alumni Field at Wabash High School. 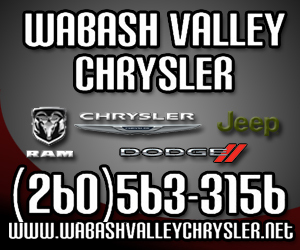 We will broadcast beginning at about 6:45 p.m. with the kickoff at 7 p.m.
Join Wabash WebTV for exciting action of Indiana High School football every Friday night and on select dates for swimming, wrestling and baseball in season. And remember, Hoosier Hysteria is around the corner. 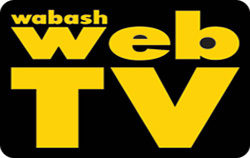 The Wabash WebTV basketball schedule will begin on Friday, Nov. 14, with the Lady Apaches of Wabash hosting Mississinewa. If you are at a game or cannot watch it live, an archive of the featured game is available on the website shortly after the completion of the games. Two weeks ago the Wabash football team had a 20-point lead over Manchester in the first half, only to have the Squires comeback to defeat Wabash. Friday night in the opening round of the sectional the two teams hooked up again for a rematch at Manchester in the opening round of the sectional with the Apaches grabbing an early lead and holding on for a 21-7 win over the Squires. On their second possession of the game the Apaches would mount a 4 play drive that ended with a pass from Chase Dirig to Grant Dirig for 28 yards with 8:01 remaining to grab a 7-0 lead after the Owen Yeadon kick. Manchester was answering the Wabash score with a big completion from Lucas Schilling and a 28-yard run from Jacob Casper to take the ball to the Apache 15, but the drive stalled on four plays with Wabash taking over on the 14. Again it would be the Dirig connection that would strike on a 70-yard score with 3:16 left and led 14-0 after the first quarter. As the first quarter ended the Squires were mounting a drive and were on the Wabash 8. The Wabash defense would then come up big when Grant Dirig intercepted a Schilling pass in the end zone. The Manchester defense would answer to get the ball back to give the Squires another shot and the Squires responded. Connecting with passes to Evan Milam and Keelan Norwood, the Squires moved the ball to the 3 yard line when Schilling found Milam on a scoring strike with 4:26 left to make it 14-7. With the tide starting to turn the Manchester defense would hold again and the offense went on the march. With :36 seconds remaining Schilling would connect with Bailey Ness on a score that was called back with the drive stalling and the half ending 14-7. It was the final game of the regular season and the Wabash County round robin as Wabash paid a visit to Southwood Friday. In a game that wasn’t decided until late, the Knights held on for a 35-21 win. The Knights would get on the board first when a Robbie Cole 39-yard run set up a Nathan Hollars 5-yard touchdown run. Goff’s extra point was good as Southwood led 7–0 with 10:05 left. The Southwood defense would hold as the Knights mounted their second drive of the quarter. Robbie Cole would get the drive going with a 47-yard run on an option and eventually scored on a 2-yard keeper to make it 14-0. The Apaches would finally get their offense on track and answer the Knights with Luke Proctor’s 13-yard run up the gut and an extra point makes it 14-7 with 2:37 left in the first quarter, which is where the quarter ended. The Apaches would strike first in the second quarter when Chase Dirig connected with Grant Dirig on a 38-yard scoring strike to even the score at 14 after the Owen Yeadon kick. The Knights would respond with a drive after a 32-yard run by Hollars sets up a Southwood first and goal. The Knights were forced to a field goal attempt that they faked with Chase Dirig intercepted a Blake Martz pass in the end zone and took it out to the 34. The Southwood defense again would hold and took the ball over with on their own 36 with 2:23 left in the half. A 30-yard pass from Cole to Zach Ball put the ball on the Wabash 20. Cole then found Nathan Hollars to the one before Cole found Ball for a 1-yard touchdown with :13.9 seconds left. Goff’s PAT made it 21-14. The cross county regionals were held Saturday at Marion and Culver with the Northfield boys and girls teams, plus four individuals advancing to next Saturday’s semi state. At Marion the girls’ race was first with the Lady Norse tying for third place and finishing third by virtue of the sixth runner tiebreaker. Jenna Halderman led the way with a 4th place finish, followed by Karla Singer in 23rd, Brittany Sloan 29th, Jacklyn Peas 35th, Olivia Thompson 39th, Natasha Leland 41st, and Caitlin Eltzroth 74th. The Southwood girls also ran at Marion, placing 9th. Emily Lehner finished 21st to advance to the semi state as an individual. The Manchester girls ran at Culver, finishing 9th as a team. No individuals advanced. In the boys’ race at Marion, the Northfield boys tied Oak Hill for first, placing second on the sixth runner tiebreaker. Northfield was led by Devin Tracy in 6th, Joe Burcroff 15th, Austin Frye 19th, Austin Andrews 30th, Noah Shear 35th, Heath Miller 64th, Mason Zolman 79th. The Wabash boys also ran at Marion, placing 8th as a team. Advancing to semi state as individuals were Sam Hall, who placed 13th, and Dominick Hubbard in 14th. Southwood’s Aaron Ross and Josiah Friedersdorf ran as individuals but did not qualify. At Culver, Thomas Rohr and Taylor Heckman ran as individuals with Rohr advancing with an 18th place finish. The Northfield boys and girls, plus Emily Lehner, Sam Hall and Dominick Hubbard will be running at the New Haven semi state while Thomas Rohr will be at New Prairie. The Northfield football team was in control of their own destiny Friday to capture the county championship as Manchester came calling with the same title on the line for the Squires. A win by the Norse would give them a perfect 3-0 county record, while a Squire win would force the tie-breaker system to determine a champion. For three quarters Friday, the game was up for grabs before a 20 point fourth quarter by Northfield gave the Norse a 34-7 win and the monster 105.9 the Bash traveling trophy for at least a year. Manchester would get the ball first to start the game, but went three and out with the Norse wasting little time striking first. On Northfield’s first play Jared Short would scamper 33 yards to the Manchester 31, then six plays later score on a 21 yard sweep to make it 6-0 with 8:01 on the clock. The Squires were moving backwards on their next possession before a roughing the passer call on the 3 yard line negated a Short interception and gave Manchester the ball on the 18. The Squires would make the Norse pay for their penalty, riding Jacob Casper and Evan Milam down the field with Lucas Schilling punching it in from 1 yard out with 1:07 left to give Manchester a 7-6 lead. Northfield ended the quarter with two Josh Bickel runs that went from their own 31 to the Manchester 44. Northfield baseball recently announced its 2014 award winners. Receiving varsity chevrons were Brad Bever, Brandon Frank, Nate Hembree, Bryce Kendall, Joseph Mitchell, Adam Roser, Shane Vigar, Dylan Brown, Drew Clark, Jakob Hayes, Mason Hovey, Remington Monce, Drake Richter and manager Courtney Pennington. Receiving JV certificates were Josh Smalley, Xian Rodriguez, Jacob Watkins, Julian Zapata, Sam Burcroff, Keaton Francis, Adam Smalley and Brady Vigar. The TRC champions had two players named to 1st team all-conference – Adam Roser and Drake Richter. Nate Hembree, Joseph Mitchell and Shane Vigar were named to TRC Academic Honorable Mention. Individual awards were also given including Most Valuable Player, Drake Richter; Most Improved, Joseph Mitchell, and Mental Attitude, Josh Smalley. The volleyball and football sectionals kick off this week with Southwood hosting the volleyball sectional and Manchester hosting an opening round football sectional game. For volleyball, Oak Hill will compete against Lewis Cass on Tuesday, Oct. 21 at 6 p.m. With Wabash facing North Miami on Thursday, Oct. 23 at 6 p.m., and Southwood facing Northfield at 7:30 p.m. following the Wabash game. Saturday, starting at 11 a.m., will be Manchester competing against Tuesday’s winner, and the Wabash/North Miami winner taking on the Southwood/Northfield winner at 12:30 p.m. The championship game will be on Saturday, Oct. 25 at 7 p.m.
Football sectionals begin Friday, Oct. 24 with Wabash playing Manchester at Manchester. Southwood also plays Friday night, at Fremont. Northfield drew a bye for Friday.